Another 12 wins & 50 nominations. When I first saw the commercials about a new cartoon-series I wasn't really impressed. 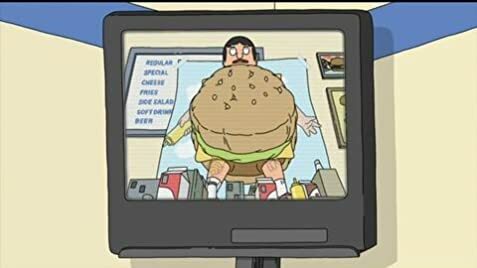 Bobs burgers, about a burgershop, really..? The style was a strong reminder of Beavis and Butthead and the short commercial didn't really impress me much. Maybe I was a bit skeptical because the last years no cartoon or animation series has impressed me much. Brickleberry for example never made me laugh and I didn't like any of the characters. When it comes to that, TV is riddled with the McFarlane cartoons and even though I still like family guy (not love), its all becoming a tad repetitive. So I gave Bob's Burgers a chance. I had to get used to the style and wasn't convinced a Burgershop could deliver anything fun, but after a few ep's I am pleasantly surprised. The pace is really good, dialogs are fast and you have to take notice of all or you will miss a joke or clever pun. The cartoon-style works, it gives a bit of 80's nostalgia and it just looks funny - seeing Louise go nuts wearing those ears is just a funny sight. The characters all work for me, I noticed a lot dislike Gene but I can see him fit in. He delivers a lot of clever (superfast) jokes (scrotumwax!) so for me he adds. Even the 'recurring characters' deliver, my fav would be Teddy ("we need a bigger restaurant!"). All in all its well-made and reasonably original (wich is rare these days) and it's actually funny. It may need to grow on you, I needed a few episodes but now I am a fan. In the pilot demo for the show, the character of Tina Belcher does not appear. Instead, the eldest Belcher child is a son named Dan. Although Dan's appearance is distinct from Tina's, the two characters are voiced identically by Dan Mintz. The end credits for every episode involve the Belchers and sometimes other characters doing various things.